The other morning when I put Brady down for his morning nap he fussed for several minutes. 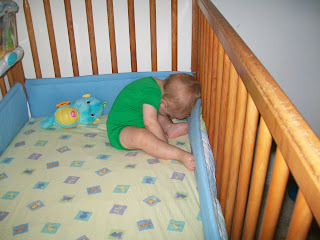 When all was quiet I went back up to check on him and found him in this awkward position. Apparently, he had been sitting there crying until he fell asleep, exhausted. Poor baby!! I did lay him down after I took the picture. Little Brady is so cute.